Summary: Researchers observe how adult neurons form and evolve in the olfactory bulb of mice. Scientists from the Institut Pasteur and the CNRS were able to make real-time observations over a period of several months that reveal how new adult-born neurons are formed and evolve in the olfactory bulb of mice. They made the surprising discovery that there is constant structural plasticity in the connections established by these new neurons with the circuits into which they are recruited. The scientists showed that this neuronal dynamism can enable optimal processing of sensory information by the olfactory bulb. These findings are to be published in the journal Neuron on June 30, 2016. Although most neurons are generated during embryogenesis, some regions of the brain, such as the olfactory bulb in rodents and the hippocampus in humans, are capable of constantly regenerating their neurons in adulthood. Scientists first conclusively discovered these new adult neurons around 15 years ago, but their function remained a mystery, mainly because they are inaccessible in living animals. In an article published in the journal Neuron, scientists from a unit at the Institut Pasteur directed by CNRS scientist Pierre-Marie Lledo provide further evidence of the highly dynamic nature of the changes observed at the neuronal level in adult brains. The scientists spent several months observing the development of neurons formed in adulthood in the olfactory bulbs of mice. 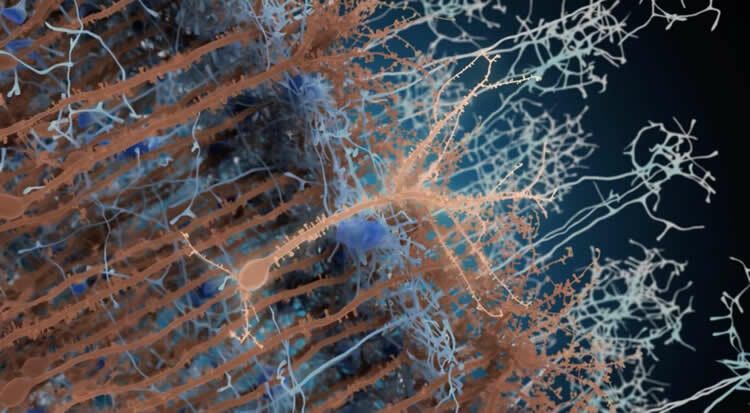 This gave them the unique opportunity to see the formation, stabilization and elimination of connections between neurons in real time. They revealed that in the olfactory bulb, where new neurons are continuously formed, the connections between these new neurons and neighboring cells are significantly rearranged throughout their lifetime. All these neurons are constantly reorganizing the billions of “synaptic” contacts they establish among themselves. The scientists were surprised by this observation. “We expected to see the synapses gradually stabilizing, as happens during brain development. But astonishingly, these synapses proved to be highly dynamic throughout the life of the new neurons. Also, these dynamics were reflected in the principal neurons, their primary synaptic partner,” explained first author, Kurt Sailor, from the Institut Pasteur. In light brown, in the center of the image, a new adult-born neuron. The neurons in blue are synaptic partner neurons, which connect to the new neurons. The neurons in dark brown are pre-existing neurons. NeuroscienceNews.com image is credited to Institut Pasteur/PM Lledo. Funding: This research was supported by the Institut Pasteur and the CNRS and was funded by AG2R-La Mondiale, the French National Research Agency, the “Revive” LabEx and the “Biopsy” LabEx. Image Source: This NeuroscienceNews.com image is credited to Institut Pasteur/PM Lledo. Institut Pasteur. “The Relentless Dynamism of the Adult Brain.” NeuroscienceNews. NeuroscienceNews, 1 July 2016. Institut Pasteur. “The Relentless Dynamism of the Adult Brain.” http://neurosciencenews.com/adult-neurogenesis-neuroscience-4611/ (accessed July 1, 2016).